The Just Play Grassroots pilot course will run throughout the week at Loto Tonga Soka Centre in Tonga. The highly-anticipated collaboration between the award-winning OFC Just Play Programme and the OFC Technical Department has taken its first steps in Tonga this week, with Tonga Football Association Technical Director Kilifi Uele testing the waters for the region by leading the first OFC Just Play Grassroots pilot course at Loto Tonga Soka Centre. 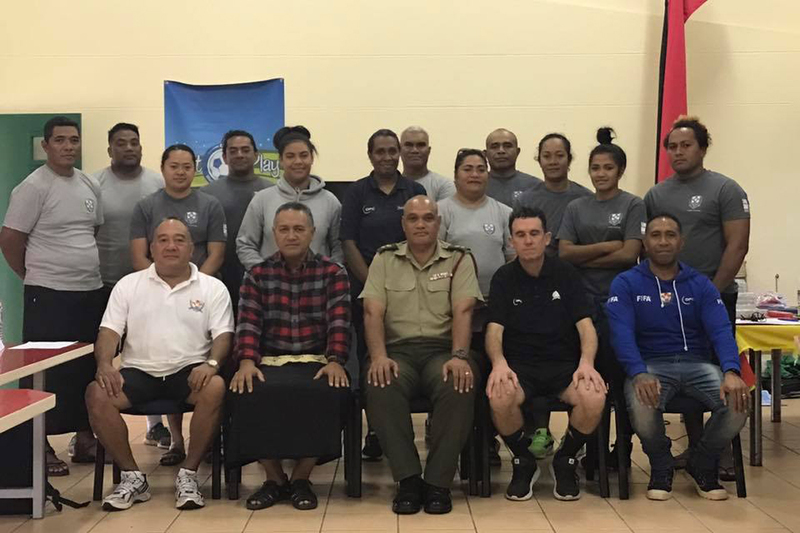 The week-long workshop is training 16 experienced coaches to harness the power of Just Play – which has successfully operated in Tonga since its pilot in 2009 – to create pathways for talented children to continue improving in football. “I think this is a good opportunity for me as head of training and education to impart my knowledge and also the vision of Tonga Football Association,” Uele said. “To grow the game we need to build up our team of coaches so that they can start building up players and improving the performance of Tonga’s national teams in the future. Uele has been joined by OFC Social Responsibility Technical Coordinator Emmie Sope and OFC Player Development Officer Paul Toohey, who have travelled to Tonga to take a back seat in Uele’s workshop and explore the links between Just Play and Grassroots in different country contexts while reinforcing the player development pathway throughout the course. The adapted Just Play curriculum integrates technical elements into sessions, allowing talented players that have shown potential in the programme to continue improving in football while still participating in the social aspects and learning of Just Play. While one of Just Play’s main objectives is to create a positive first experience in sport, the new curriculum will allow aspiring athletes to take the next step and start developing their football skills at an earlier age. OFC Head of Social Responsibility Franck Castillo is overjoyed to see the much-awaited collaboration come to life and is excited to see the future impact of the adapted programme following the success of the pilot in Tonga. “After eight years of success with the OFC Just Play programme, we are thrilled to work closely with the OFC Technical Department to include a social component into the OFC Grassroots programme,” he said. The OFC Just Play Grassroots pilot course will conclude on Friday 4 August. The adapted content will be implemented through a 12-week pilot programme in Tonga before – following the success of the pilot – it is disseminated throughout the region.